It's no secret that a vast majority of Hollywood leans liberal, and so when an actor breaks ranks to align with the GOP, it can come as a bit of a surprise. Such is the case with Jon Voight, known for his roles in Midnight Cowboy, Deliverance, Coming Home, and Ray Donovan. Voight has been a vocal supporter of presumptive Republican presidential nominee Donald Trump. Though the candidate has had a difficult time recruiting people to speak at this week's Republican National Convention, he has an ally in the actor. But despite this big-name endorsement, it looks like Voight will be a no-show at the Republican National Convention this year. Voight is one of Hollywood's most outspoken conservatives and endorsed Trump in March of this year. Since then, the actor has been on a mission to "support [Trump] in any way" that he can, and told The Daily Beast in June that he had been in talks with Trump's campaign for months to do just that. To some, Voight's support may come off as a little bizarre, considering Trump's repeated digs against the actor's daughter, Angelina Jolie. Regardless, Voight told Breitbart News that he would be championing Trump, and urged fellow conservatives to do the same. "He is the only one who can do it. No frills, no fuss, only candid truths … I pray all Americans who have seen and felt the meltdown of America with the Obama years, to please fight for Donald Trump. He will not let us down ..."
But apparently, Voight wasn't needed at the convention. He won't be using his Hollywood platform there the way, say, Clint Eastwood did for 2012 Republican nominee Mitt Romney during his now-infamous "empty chair" speech. According to Billboard, a representative for Voight confirmed that he will be skipping out on the Cleveland convention altogether. From the looks of it, the star-studded night Trump had promised may not be happening at all. The publication lists a series of other actors and artists who have declined to attend the convention, citing conflicting schedules or, in the case of former NFL star Tim Tebow, confirming that their supposed attendance was just a rumor in the first place. 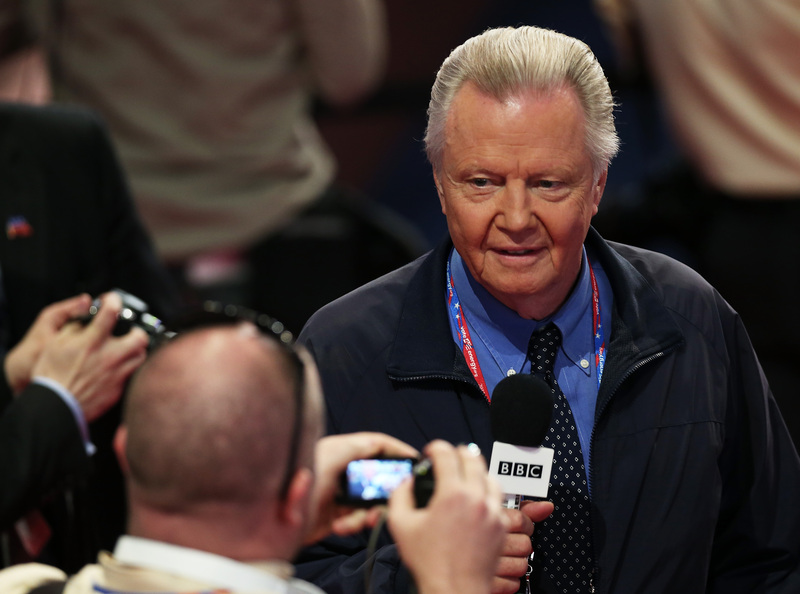 Voight's absence may therefore point to a larger problem within the Trump campaign and the convention — a lack of support when it counts, from both Republican officials and celebrities, who are consistently distancing themselves from the candidate.